T C in a B? Weeknights get busy. My people still get hungry. This can be a problem. One of my favorite solutions has a very catchy name – I call it a” bowl.” Mrs. Plant of Mrsplantintexas.com has a similiar dish – she calls it TC in a B (“throw crap in a bowl”). Here’s how it goes. Start with a cooked grain, typically guinoa or brown rice at my house. Once in a while I get more creative. 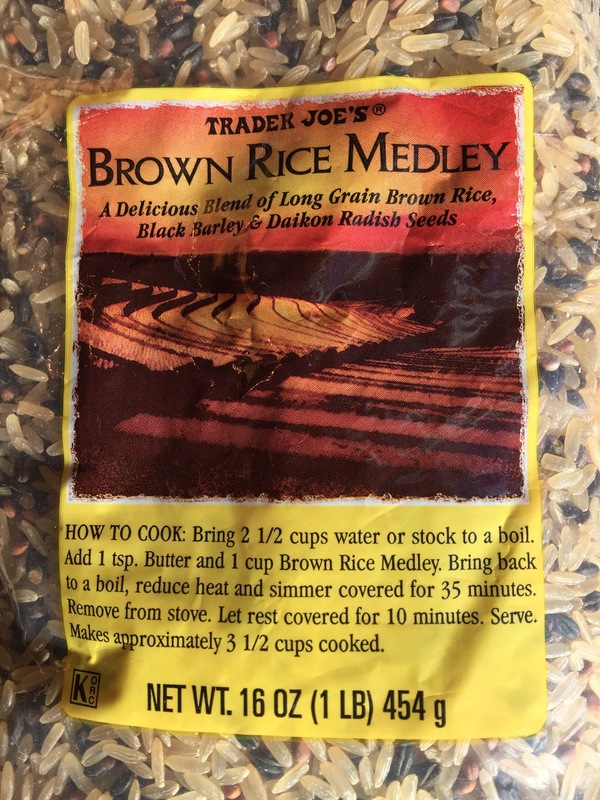 I really like this rice mix that Florence Johnson found at Trader Joes that has these crunchy little radish seeds mixed in. You can picture me cooking up a creative blend of grains but the real life version is that this meal usually starts with whatever leftover grains are in the fridge. The next step is called clean out the veggie crisper. When I did this Tuesday night, I put out thinnly sliced carrots, chopped green onions, kale torn in small bite sized pieces, diced celery, and frozen green peas (that I ran hot water over for a few secs.) 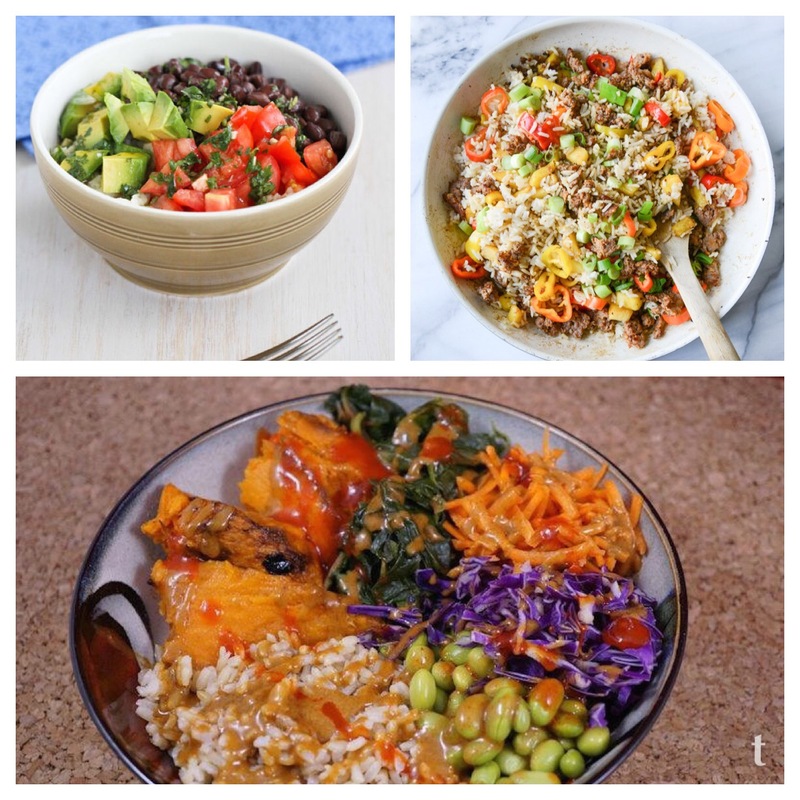 Other times it has included asparagus, broccoli, purple cabbage, spinach, sweet potato, green beans, garbonzo beans, black beans, red onions, mandarin oranges, pineapple…and the list goes on…and on. So here’s how dinner goes. Cook or reheat the grains. Slice and dice the veggies and put it all on the table with some big bowls. Let everybody create their own bowl, starting with the grain and then topping with veggies of their choice and drizzling with sauce. The pictures above are not mine. When I serve this meal, time is tight and people are hungry – both factors make taking pictures tricky and possibly even dangerous. BONUS: 2 bonus points today for sharing your favorite quick weeknight meal idea and an extra bonus point for a pic to go along with the idea.